Every Stanley Cup winning team of the past 83 years is still around. But on rare occasions a new NHL franchise considers adopting the name of a defunct prior Cup winner — like Seattle with the Metropolitans — commemorating past titles gets tricky indeed. A local sports fan asked me about the Seattle Metropolitans and whether other hockey teams had ever folded after winning the Stanley Cup. Actually, it happened frequently with late-1800s and early 1900s winners, but the Cup competition itself was more structured and professionalized by the time the Metropolitans claimed their 1917 title. The National Hockey League’s subsequent formation and commandeering of the Cup by 1927 as its de facto championship trophy made it increasingly less likely winners would later disband. In fact, only two Cup winners since — the 1927 Ottawa Senators and 1935 Montreal Maroons — have ceased operations. Every winner the past 83 years is still around, which raises an interesting issue pertaining to our city. Namely, the delicate matter of hoisting championship banners for long-defunct teams that have their name used years later by an entirely different franchise. If our expected NHL expansion team revives the Metropolitans name, should it hang a banner celebrating the previous 1917 title? Likewise, should any new SuperSonics franchise hang the 1979 NBA championship banner won by the prior one? Legally, a court settlement paved the way to eventually reuse the Sonics name, colors and old banners if a new NBA team comes here. My question is more of a moral one: How do fans feel about an entirely new franchise celebrating something it had nothing to do with? For every history buff arguing the blood, sweat and passions behind championships should not be forgotten just because a business plan failed, you’ll have another demanding a statute of limitations be put on teams misappropriating somebody else’s past success for cheap prestige. Take the Senators, for instance. Six decades after that Cup-winning franchise relocated to St. Louis in 1934, folding soon after, the “Senators” name was revived by an NHL expansion team in Ottawa for the 1992-93 season. That newer team hasn’t won a Stanley Cup, losing to Anaheim in a lone 2007 finals appearance. Yet, the rafters at the team’s Canadian Tire Centre home arena are teeming with Stanley Cup banners — all commemorating the long-ago-disbanded Senators franchise that never even played there. There’s a banner celebrating the 1927 win and 10 others for Cups prior, put up by the newer franchise’s ownership and giving off an aura typically found in arenas of “Original Six’’ legacy teams. Many fans were pleased to see the newer team bridging a gap with the city’s hockey past. But some were put off by the Senators hanging banners over the ice the way championship teams do. A franchise that hadn’t won anything was suddenly flying as many Cup banners as the storied Detroit Red Wings. It sure seemed to some like the newer Senators were tackily appropriating somebody else’s championships. The team in 2017 quietly redid some of the earlier Cup year banner designs to more accurately depict the prior franchise’s look. Some teams avoid even going there at all. 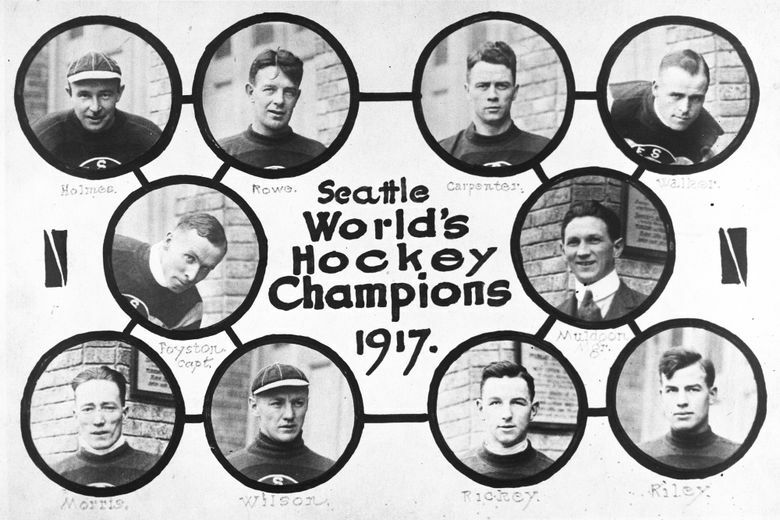 The Vancouver Millionaires won a lone Stanley Cup in 1915 before folding in 1926, but the current Canucks squad founded in 1970 eschewed the name and largely ignored the former team until 2010. That’s when it bought rights to Millionaires logos, jerseys and trademarks and designed a throwback uniform honoring them, though you won’t find a 1915 championship banner hanging at Rogers Arena. In my Montreal hometown, all 24 Stanley Cup banners at the Bell Centre were won by the same Canadiens franchise that’s played continuously since 1910. No Maroons banners from 1935, or a prior title in 1926, even though both teams once shared the fabled Montreal Forum and even briefly had the same ownership. Instead, two replica Maroons banners hang at the nearby Westmount Arena along with those of other defunct Cup-winning teams from Montreal. It’s funny, though, because the Forum was actually built exclusively for the Maroons, with the Canadiens only joining them two years later after a fire gutted their arena. And yet, only Canadiens banners hung at the Forum for decades before the team moved out in 1996, the titles won there by the original Maroons tenants apparently forgotten. So, banners for a long-dead Senators franchise displayed prominently at an arena they never played at by a current team with zero connection to them is a departure from the norm. Sure, both “Senators” incarnations share a name. But whether that makes it less awkward to fly somebody else’s Cup banners isn’t so clear-cut. Interestingly, this debate likely won’t apply at all to any incoming NBA squad here. There’d be riots if that team named itself anything but “Sonics’’ and refused to hoist the 1979 title banner. Why the difference? Probably because the aforementioned “statute of limitations’’ on their past success hasn’t run out yet. Most Sonics fans are still alive. They vividly remember the prior franchise and feel a deep connection because its relocation to Oklahoma City happened only a decade ago. Conversely, any living Metropolitans fans have likely had their 100th birthday. Local hockey supporters have no profound connection to a team that could easily be honored in some arena corridor or side museum without complaint. It’s nice that a Senators dynasty once voted the greatest Canadian hockey squad of the 20th century’s first half gets featured so prominently in Ottawa. But there is a whiff of desperation it gives off, unlikely to subside until the middling current Senators get their act together and add a 12th Stanley Cup banner that isn’t borrowed off somebody else. As for our city, the Metropolitans, like the Maroons and Millionaires, weren’t a dynasty. And my guess is, when the puck drops at KeyArena, the only thing hanging over the ice will be empty space the new franchise hopes to fill on its own merit.